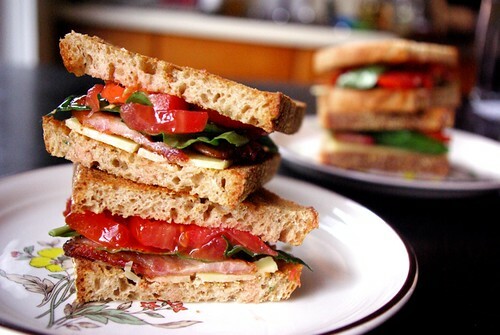 dubliner cheddar, farm bacon, tomato and basil on whole wheat tuscan bread, originally uploaded by aarn! +20th April, 2009+. cooked up some 1/4-inch thick slices of some local farm bacon. spread some of the bacon drippings on a few slices of toasted tuscan whole wheat bread. placed on the bread some thin slices of dubliner cheddar, the bacon, whole leaves of fresh basil, and some tomatoes which had been tossed in some olive oil, lemon juice, and black currant jam. now THAT is a sandwich. love it. But I'm totally using this as a guide later in the summer.